For 30 years the Swiss based World Economic Forum has been working to better understand why it is that some nations succeed and become prosperous, while others struggle and remain poor. They collect hard data from a variety of national and international sources, as well as surveying business leaders and citizens in each of the countries being examined. It is this information that makes up their Global Competitiveness Reports. While survey methods are clearly not infallible the reports nevertheless provide a useful assessment of the productive potential of nations worldwide and in doing so, they contribute to a greater public understanding and insight into the key factors that drive economic growth and prosperity. The reports cover countries in all stages of economic development and provide an insight into the transformations that occur as they improve their economic outlook. They explain that during the first phases of development, countries tend to rely on low-skilled labour and natural resources, but once wages start to rise – if prices are to remain competitive – improvements in worker productivity are necessary in order to sustain the higher incomes. As economies become more developed, it is businesses efficiency and product quality that need to be increased, in order to pay for rising wages. Progress is therefore driven by higher education and training, more efficient goods markets, well-functioning labour markets, well-developed financial markets, a greater use of technology, and growth in market share. When countries enter the final stage of their development – where New Zealand is now – the key to growth and greater prosperity is innovation. Higher wages and higher living standards are only sustainable if businesses are able to compete with new and unique products and services. Each country surveyed for the Global Competitiveness Report is ranked on 111 separate indicators. Those indicators are then grouped into 12 pillars of competitiveness: the quality of institutions, infrastructure, the macroeconomic environment, health and primary education, higher education and training, goods market efficiency, labour market efficiency, financial markets development, technological readiness, market size, business sophistication, and innovation. Since these provide useful indicators of a country’s progress, it is worth defining them. 1. Institutions: a country’s institutional environment (whether it protects private property rights, the rule of law and the sanctity of contract) is determined by the legal and administrative framework within which individuals, firms, and governments interact to generate wealth. 2. Infrastructure: a well-developed transport and communications infrastructure network is a prerequisite for business success. It also ensures that less-developed communities can share in a nation’s progress. 3. Macroeconomic environment: the stability of the macroeconomic environment (government spending and debt, inflation and interest rates, national savings and credit ratings) is important for business, investment, and the overall competitiveness of an economy. 4. Health and primary education: a healthy and well-educated workforce is vital to a country’s competitiveness and productivity. 5. Higher education and training: quality higher education and training is crucial for economies as they move up the value chain to produce more added-value goods and services. 6. Goods market efficiency: healthy competition is essential for ensuring that the most efficient firms, producing goods demanded by the market, are the ones that thrive. Competitiveness is hindered by distortionary taxes, by restrictive rules on foreign direct investment and international trade, and by protectionism. 7. Labour market efficiency: efficient and flexible labour markets are critical for ensuring that workers are allocated effectively within an economy and are provided with incentives to give their best effort in their jobs. 8. Financial market development: an efficient financial sector allocates national and international investment to its most productive use, but since entrepreneurial projects with high rates of return attract most investment, thorough risk assessment is a key ingredient of sound financial markets. 9. Technological readiness: technology is increasingly essential if firms are to compete effectively and prosper. 10. Market size: since larger markets allow firms to exploit economies of scale, their productivity increases as market size (domestic and export) grows. That’s why trade openness is positively associated with growth. 11. Business sophistication: sophisticated business practices – including the quality of a country’s overall business networks as well as individual firms’ operations and strategies – are conducive to higher efficiency in the production of goods and services. 12. Innovation: the final pillar of competitiveness focuses on the need for technological innovation. The reality is that although substantial gains can be achieved by countries through improving institutions, building infrastructure, improving macroeconomic stability, raising human capital, and increasing the efficiency of the labour, financial, and goods markets, over time these factors give diminishing returns. That means that in the long run, living standards can only be enhanced through technological innovation. Technological breakthroughs have, of course, been at the centre of many of the huge leaps in human progress. Today’s digital revolution is transforming not only the way businesses operate but the way we live our lives. The Global Competitiveness Report suggests that in those countries that have reached the innovation stage, businesses must develop cutting-edge products and services if they are to maintain a competitive edge and move toward even higher value-added activities. This requires an environment that is conducive to innovation and entrepreneurialism – supported by both the public and the private sectors. In thinking about these 12 ‘success factors’, the question that springs to mind, is whether our government is doing all that it can to enhance the ability of New Zealand businesses to grow and prosper. However, before we can answer that question, we need to have a closer look at the country rankings. The top 20 countries in the Global Competitiveness Report are Switzerland in first place, followed by Singapore, then Finland, Germany, United States, Sweden, Hong Kong, Netherlands, Japan, the United Kingdom, Norway, Taiwan, Qatar, Canada, Denmark, Austria, Belgium, New Zealand, the United Arab Emirates, and Saudi Arabia. 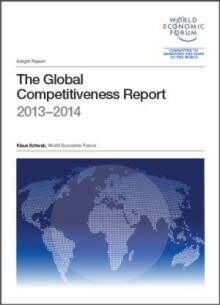 For each country studied, the report provides key economic information based on 2012 data, it scores the countries individually on the 111 indicators then aggregates them into a ranking based on the 12 pillars of competitiveness, and it highlights the areas that are the most problematic for doing business. At 18th place, the report shows that in 2012, New Zealand had a population of 4.4 million, a Gross Domestic Product (GDP) of US$169.7 billion, and GDP per capita of US$38,222. In our case, the top three problem areas identified are an inadequate supply of infrastructure, an inadequately educated workforce, and insufficient capacity to innovate. Also problematic are an inefficient government bureaucracy, difficulties accessing finance, high taxes, and policy instability. In comparison, the top ranking country, Switzerland, with a population of 7.9 million, a GDP of US$632.4 billion, and a GDP per capita of US$79,033, has as their top three problems, an inadequately educated workforce, an inefficient government bureaucracy, and tax regulations. And for Singapore, the country that is ranked second, with a population of 5.2 million, a GDP of US$276.5 billion, and GDP per capita of US$51,162, the major problems identified are restrictive labour regulations, inflation, and insufficient capacity to innovate. Of particular interest to New Zealand is Australia. In 21st place, Australia has a population of 22.3 million, a GDP of US$1.542 trillion, and a GDP per capita of US$67,723. Their top three problem areas are identified as restrictive labour regulations, an inefficient government bureaucracy, and high taxes. The income gap with Australia has, of course been a major problem for New Zealand, and is largely responsible for the loss of some 500,000 Kiwis who are estimated to have crossed the Tasman for life in the ‘lucky country’ at the peak. However, while the gradual slowdown of the Australian economy has started to drive some New Zealanders back home, as a result of the weekend’s general election, an economic turnaround is imminent. Prime Minister-elect Tony Abbot’s Liberal-National Coalition comprehensively defeated the division-plagued Labour Government. Out of the 150-seat Parliament, the Coalition won 88 seats, the Labour Party 57 seats, the Greens 1 seat, Katter’s Australian Party 1 seat, the Palmer United Party 1 seat, and there are 2 Independent seats. The final results for the 40 seats being contested in the 76-seat Senate are yet to be announced. The policy agenda being promoted by Tony Abbot includes stronger control of Australia’s finances: reducing government spending, cutting public service jobs, lowering debt, and returning the budget to a surplus by 2016. In addition company tax will be lowered to 28.5 percent to stimulate the business sector and make Australia more tax competitive, the mining tax will be abolished, the unpopular carbon tax scrapped, and unachievable renewable energy targets will be dropped. Other policy targets include stopping asylum seeker boats (400 in the last year), scaling down the high-speed broadband rollout, extending paid parental leave to 6 months on full pay for parents earning up to $75,000, and a free trade deal with China. With the income gap with Australia clearly a big issue for New Zealand, and Tony Abbott confidently declaring that “Australia is under new management and is once again open for business”, the pressure is now on John Key’s government to substantially lift our performance. While National appears to be fully committed to a business growth agenda, which includes major investments in infrastructure, strategies to lift educational achievement, and research funding boosts to increase innovation – the three areas identified in the Global Competitiveness Report as being major impediments to New Zealand’s progress – they would do well to follow Australia’s lead and get rid of the Emissions Trading Scheme. Our bureaucratic and costly ETS was set up to align with Australia’s proposed scheme, but now that Tony Abbot is going to scrap the carbon tax instead of turning it into an ETS (as the Gillard Labour Government had proposed) the main reason for retaining the ETS has disappeared. Scrapping the ETS would enable New Zealand businesses to become more globally competitive – raising our living standards and improving our economic outlook – and it would also help to ease the pressure on household budgets through lower power prices and fuel costs. This week’s poll asks: Do you agree that it’s time to scrap the Emissions Trading Scheme? Do you agree that it’s time to scrap the Emissions Trading Scheme?